The club has published its newsletter Safety Systems three times a year since 1991. The newsletter is distributed to paid-up members and can be made available in electronic form for inclusion on corporate members' intranet sites. An index of Newsletters since January 1998 is available on this page. The proceedings of the annual symposium, held each February since 1993, are published in book form. Copies can be purchased from the publisher and for SSS'13 and later are available on Amazon. Details of all Symposium proceedings are available on this page. All publications are available to download free by current SCSC members (please log in first), recent books are available as 'print on demand' from Amazon at reasonable cost. Proceedings of the Twenty-seventh Safety-Critical Systems Symposium, Bristol, UK. Proceedings of the Twenty-sixth Safety-Critical Systems Symposium, York, UK. Version 2 of the Goal Structuring Notation Standard. This document was written by the Data Safety Initiative Working Group (DSIWG), which is convened under the auspices of the SCSC. The document supports the DSIWG's vision, which is to have clear guidance that reflects emerging best practice on how data (as distinct from software and hardware) should be managed in a safety-related context. This update takes account of the consensus that a process-based guidance document will complement existing safety management processes, making it more useable. It was formally released at SSS’18, 6-8 February 2018. Data, as distinct from software and hardware, has been a contributing factor in many accidents and incidents. The impact of data-related issues continues to grow as we rely moer and more on data-driven systems. The inclusion of data as a potential cause of harm is a crucial part of a thorough safety assessment. Explicitly considering data in this way also provides additional business and societal benefist including reduced harm, reduced commercial liabilities and improved business efficiencies. The book has been developed by the SCSC Data Safety Initiative Working group (DSIWG), a cross-sector groups set up to address the challenges of data safety. 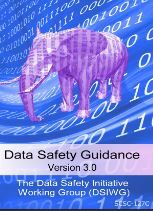 It provides guidance on how data should be managed in a safety-related context. This edition further refines and restructures the quidance to explicitly distnguish between normative, informative and discursive text to assist users who which to claim a level of compliance with this document. [SCSC-137] Agile Methods for Developing Safety-related Software? Proceedings of the Twenty-fifth Safety-Critical Systems Symposium, Bristol, UK. Proceedings of the Twenty-fourth Safety-Critical Systems Symposium, Brighton, UK. Proceedings of the Twenty-third Safety-Critical Systems Symposium, Bristol, UK. Proceedings of the Twenty-second Safety-Critical Systems Symposium, Brighton, UK. Proceedings of the Twenty-first Safety-Critical Systems Symposium, Bristol, UK. Proceedings of the Twentieth Safety-critical Systems Symposium, Bristol, UK. Proceedings of the Nineteenth Safety-critical Systems Symposium, Southampton, UK. Proceedings of the Eighteenth Safety-critical Systems Symposium, Bristol, UK. Proceedings of the Seventeenth Safety-critical Systems Symposium, Brighton, UK. Proceedings of the Sixteenth Safety-critical Systems Symposium, Bristol, UK.